The market has finally challenged our preferred count to either step up or be eliminated. 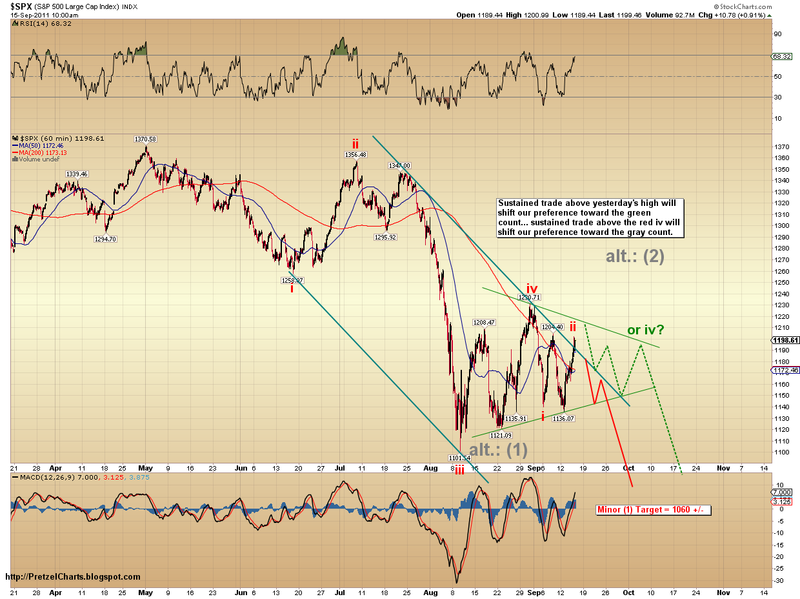 The preferred count would view this most recent rally as wave c-up of an a-b-c wave ii. It is make or break time for this count, which, we must admit, has had a very good run so far. 10 days of solid, on-the-money calls should certainly allow for a target to be overshot every now and then. Fourth waves are very challenging trading environments, because they almost always move back and forth over the same territory many times before making a decisive break and, due to their corrective nature, they can be very difficult to accurately count. This has certainly been the case so far... although if the market breaks down from here, our preferred count will have passed the challenges presented with flying colors. Be that as it may, it is time to give more consideration to some alternate possibilities. I have labeled three potential counts on this chart, and annotated some things to watch for. The preferred count has taken its first hit, but is still standing and is represented in red. Our first alternate would be a fourth wave triangle, shown in green. Our second alternate would be that Minor (1) down already completed, and we are now in Minor (2). It is shown in gray. The market should allow us to start eliminating one or more of these counts in the near future. The one virtual certainty we can stand on is that this entire move since early August is clearly corrective in nature, and should ultimately resolve to the downside. Trade safe!